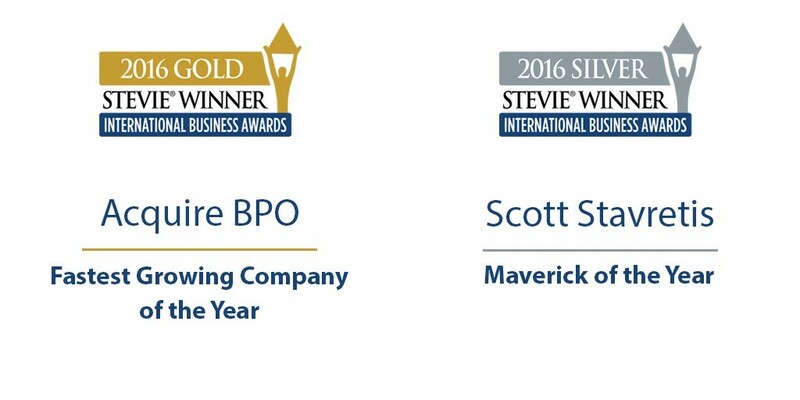 Acquire BPO was named the winner of the Gold Stevie Award for Fastest Growing Company of the Year – Asia Pacific at the 13th Annual International Business Awards. Acquire’s CEO, Scott Stavretis, was also awarded the Silver Stevie Award for Maverick of the Year. The awards will be presented at a gala banquet in Rome, Italy on 21 October. The International Business Awards, nicknamed the Stevies, are considered one of the world’s premier business awards programs. Over 3,800 nominations from more than 60 countries were submitted by individuals and organisations from nearly every industry—a record total for the awards. Acquire grew from 4,000 employees in 2014 to 7,000 employees in 2015, making the organization Australia’s largest outsourcer to the Philippines. “The company has also grown rapidly in a short 10-year time period, highlighting excellent growth strategies maintaining service standards,” says one judge of Acquire’s significant business growth and geographic expansion to North America. “Scott Stavretis is an inspirational entrepreneur that has the strategic insight to take a business to a new level of success. His full-rounded approach to business is impressive and an example to be followed,” says one judge of Stavretis’ ability to take Acquire’s ‘Australian success story’ to the global stage. Stevie Award winners were determined by the average scores of more than 200 executives worldwide who participated in the judging process from May through early August. “This year’s IBA judges were treated to many remarkable and inspiring stories of achievement around the world,” said Michael Gallagher, president and founder of the Stevie Awards.